Why integrate Google Analytics with Appcues? Integrating Google Analytics with Appcues to find out how different acquisition channels affect user interactions with your flows. This integration can help you identify where your most engaged and active users come from to help you focus in on marketing efforts. Enable Google Analytics at your integrations page by hovering over the Google Analytics integration and selecting Activate. Note: If you are a Segment user, integrate Appcues with Google Analytics directly through your integrations page. Enabling the integration via Segment may omit flow details. Once Google Analytics and Appcues are integrated, you can find Appcues events under Behavior > Events > Overview in your Google Analytics Reporting tab. You can view how users interacting with all your flows under Events Action, or refine you view further under Event Label. Why integrate Amplitude with Appcues? Integrating Amplitude with Appcues will help you measure the impact of your flows. Get insight into how churned users interact with flows and experiment with guiding users to their activation or "Aha" moments with flows. Create funnels in Amplitude to test and adjust your flows for the best impact. An Amplitude account and Appcues account, both fully installed on your app across the same pages and domainsOnce Amplitude and Appcues are integrated, you can view Appcues interactions under User Activity > Event Stream. 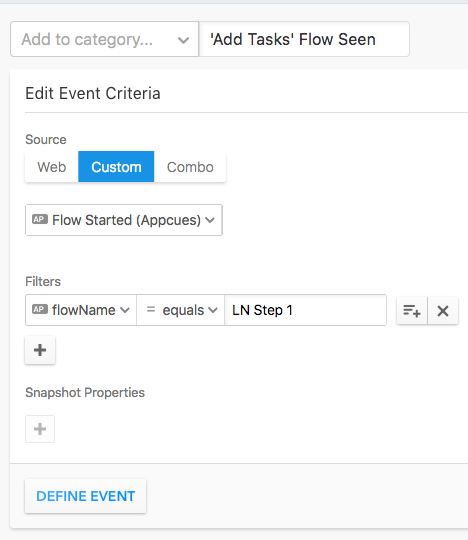 Appcues events appear on a general level, such as Flow Completed, Flow Started, Step Skipped, etc, and you can view further details like event properties by expanding individual events. To get the most out of this integration, you'll also want to be tracking events from your own application in Amplitude. These events might look like User signed up, created project, invited user, sent email, etc. -- it all depends on what your platform is and what your users can and should accomplish within it. 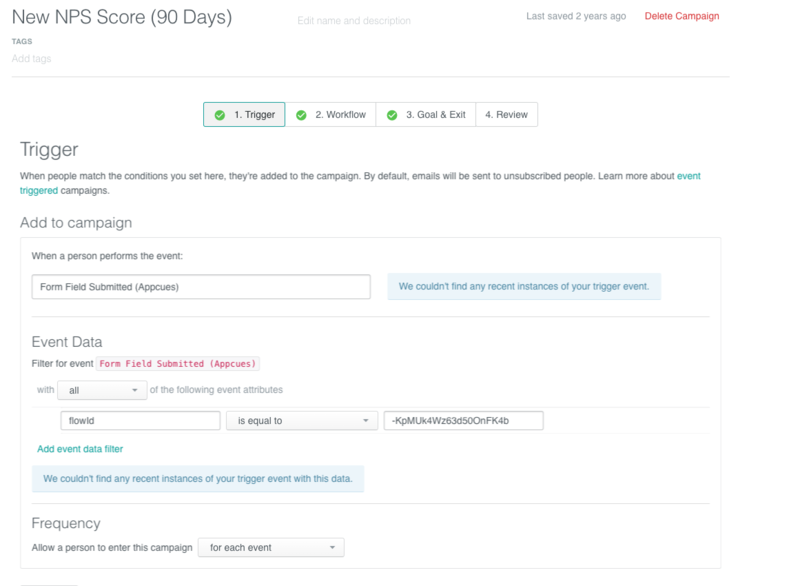 To measure the impact your Appcues flow has on your users behavior, define the Appcues event first in your funnel and follow it with the corresponding behavior. In Amplitude, hit Create Chart. For a funnel report, select Funnel Analysis. In our example, we want to encourage users to add a task in our demo app. We created a flow that shows them how to do so ( 'Add tasks' tour) and now want to how many users who viewed the flow actually added a task in their account. Because we're looking at the impact of the flow on the behavior of actually creating hotspots, we'll use that flow event first. Next, we select the event of Created Task. Created Task is a non-Appcues event we are capturing on our demo platform. Why integrate Mixpanel with Appcues? After you've built a user onboarding experience in Appcues, you can track its performance in Mixpanel. 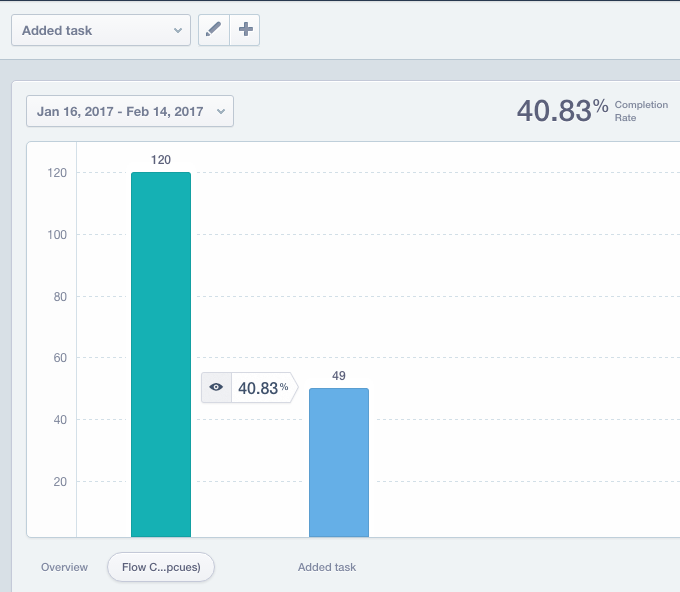 Setting up onboarding, activation, and retention funnels in Mixpanel can also help you test and adjust your flows for these metrics. Note: If you've installed Appcues via Segment, integrating Segment with Mixpanel will automatically integrate your Mixpanel and Appcues accounts. 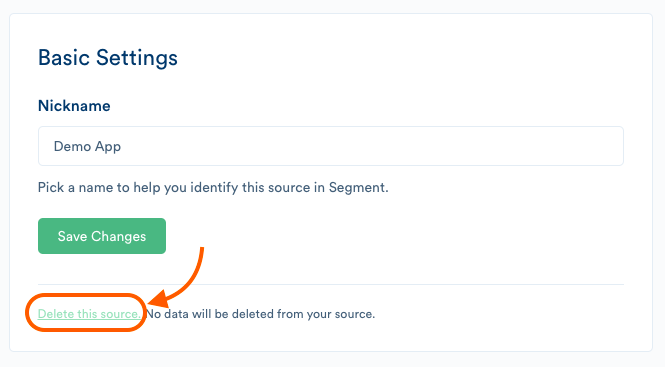 Do not enable both a Segment and Mixpanel integration: doing so will result in duplicate data. Learn more about installing Segment here. Once Mixpanel and Appcues are integrated, you can find Appcues data as custom events in Mixpanel.At first glance, you'll be able to see general events such as Flow Completed, Flow Started, Step Skipped, etc. If you'd like to view these events in more detail you can separate them by specifics like flowName or flowID. 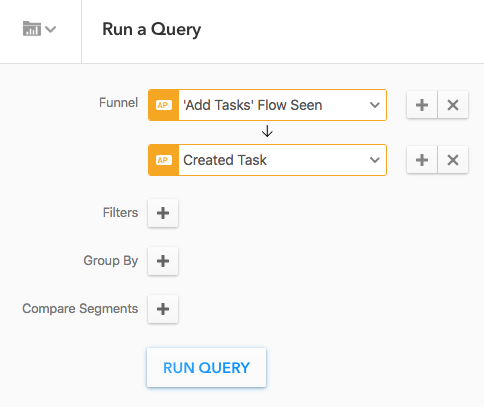 To see the effect Appcues has on your users' behaviors, create a funnel in Mixpanel to see how many users complete a desired outcome based on the Appcues flow(s) they view. In this example, we want to increase our users' activation event of adding a task. To improve activation of this event, we created a flow called 'Add Task' tooltips. 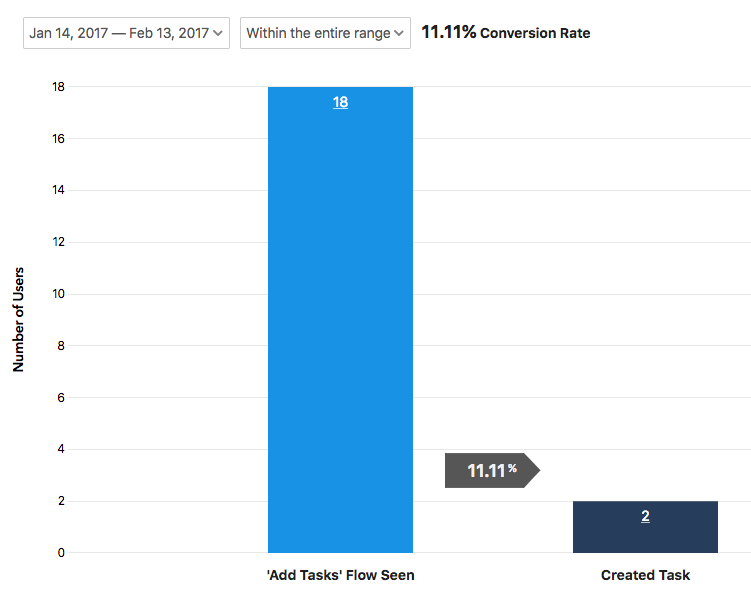 To measure the success of this flow, we can create a funnel that shows us how many users who started the 'Add Task' tooltips actually did add a task to their account. Save the steps in your Mixpanel funnel to view your results. Need more help? 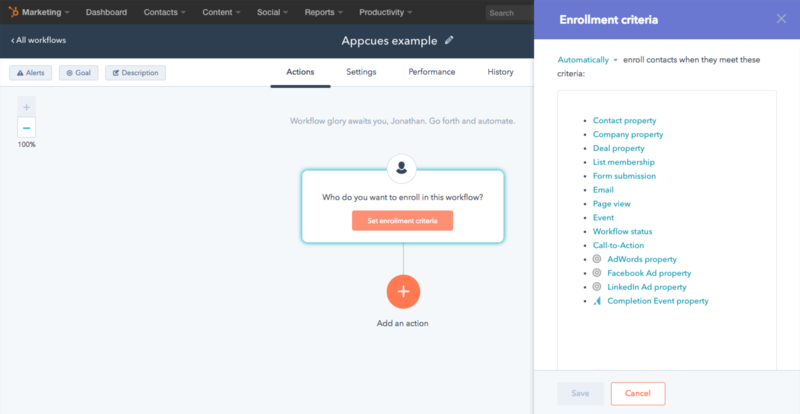 Check out this detailed post: How to Set Up Mixpanel Funnels for User Onboarding Success. Enable Heap at your Integrations page by hovering over the Heap integration and selecting Activate. Once Heap and Appcues are integrated, you can find Appcues data under your Events category. Appcues events appear on a general level, such as Flow Completed, Flow Started, Step Skipped, etc. To get the most out of this integration, you'll also want to be tracking events from your own application in Heap. These events might look like User signed up, created project, invited user, sent email, etc. -- it all depends on what your platform is and what your users can and should accomplish within it. By creating a new event you can specify which Appcues flow you'd like to use in your funnel. In our example, we want to get users to add a task in their account. To encourage them to do so, we created a flow telling them why and how to add a task. To track how many users created a task in our our demo app after seeing our flow, we'll create a funnel. We'll define the flow being seen as the event of Flow Started (Appcues). Then, we specify which flow tells our users to add tasks - in this case, it's LN Step 1. In our example, we've just created the 'Add Tasks' Flow Seen event. Since we want to look at the impact of that flow on the behavior of actually creating a task, we'll use that event first. Next, we select the event of Created Task. Created Task is a non-Appcues event and instead directly pulled from our platform. Run query to view your results. 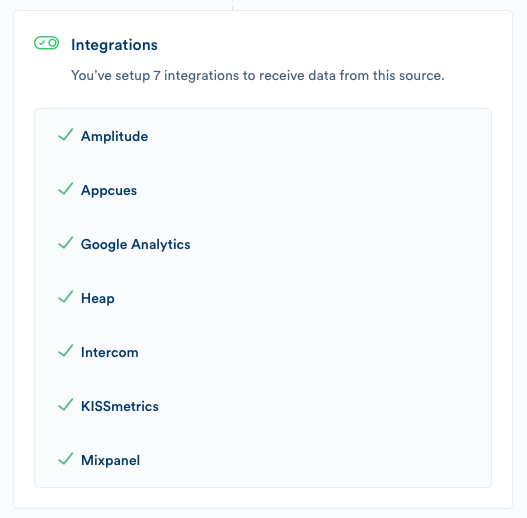 Why integrate Kissmetrics with Appcues? Integrating Kissmetrics with Appcues will help you measure the impact of your flows. Get insight into how churned users interact with flows and experiment with guiding users to their activation or "Aha" moments with flows. Create funnels in Kissmetrics to test and adjust your flows for the best impact. Why integrate Klaviyo with Appcues? Integrating Klaviyo with Appcues will help you target users based on what they did with Appcues. For example, send an email a week later if a user skipped your feature announcement tour. Why integrate Localytics with Appcues? Integrating Localytics with Appcues can help you do things such as send a push notification to a user who completed a flow. If you track your users across devices this is a great UX. Ask users if they want to try out and app feature, then notify them on their phone with a deep-link to it. Why integrate Customer.io with Appcues? Why integrate Intercom with Appcues? Integrating Intercom with Appcues will help you see which users are interacting with which of your Appcues flows. You can also send survey responses (like NPS scores) directly to Intercom. You can find a list of more events here at our Client-side Events Reference! Why integrate Vero with Appcues? Integrating Vero with Appcues will help you reach out to users depending on what they did in Appcues. For example, you can send an email two weeks later if a user skipped the onboarding flow. Why integrate Woopra with Appcues? With Woopra you can analyze and visualize the entire customer journey from first marketing touch all the way through immersive product usage, email and chat interactions etc. By integrating this with Appcues you can do things like send a congratulations email after a user finishes a checklist. The Appcues to HubSpot integration is a one-way integration, that creates timeline events in the HubSpot CRM. These events occur every time a user completes or skips an Appcues step action. These HubSpot events can then be used in HubSpot to trigger campaigns, sort users, and other actions. Why integrate HubSpot with Appcues? Integrating HubSpot with Appcues allows you to target marketing campaigns based on how users interact with Appcues flows. It can also help your sales team identify how individual contacts interact with flows, including how they respond to NPS surveys or forms you create with Appcues. After selecting the HubSpot integration, you’ll be redirected to HubSpot, which will allow you to authorize the Appcues integration within your HubSpot account. Appcues events will then automatically be sync'd to your HubSpot account. This sync will then occur every night at 3am US Eastern Time. Once these events begin to pass, you will see these step events on a contact's timeline and for use in HubSpot Workflows. Note: *If you've turned on this integration before 3/20/18* and the email we are sending is not already in your HubSpot contacts database, they will be added as a new contact. Since HubSpot charges based on number of contacts, we can turn this off for you on our end. Reach us at support@appcues.com for any assistance with this matter. The only data that we send to HubSpot is the data from your users interactions with the Appcues flows. You can read more about these types of events here. We do not send over any of the information you've passed to Appcues in your identify call. 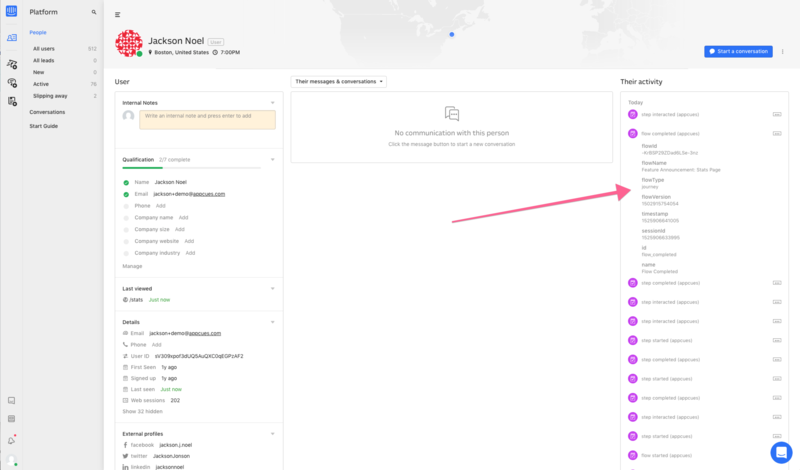 The only other option available for use in the Appcues-HubSpot integration is the ability to only send events for users who are already in the HubSpot CRM or filter any events for users who aren’t in said CRM. This is disabled by default in HubSpot, but can be turned on manually. Through the Appcues-HubSpot integration, we send skipped or completed event data for Appcues Steps only. Because of this, instead of targeting by “Completed Flow”, you’d want to target by the user completing the last step of a particular flow. This also means that for any flows with multiple step groups, we will send an event to HubSpot for each step the user reaches. We do not send over any of the information you've passed to Appcues in your identify call. You can trigger emails users who interact with Appcues in certain ways. For example, if you know that people who skip out on your onboarding flow are less likely to purchase your product, you might send those users an email to personally onboard them with a 1:1 demo. 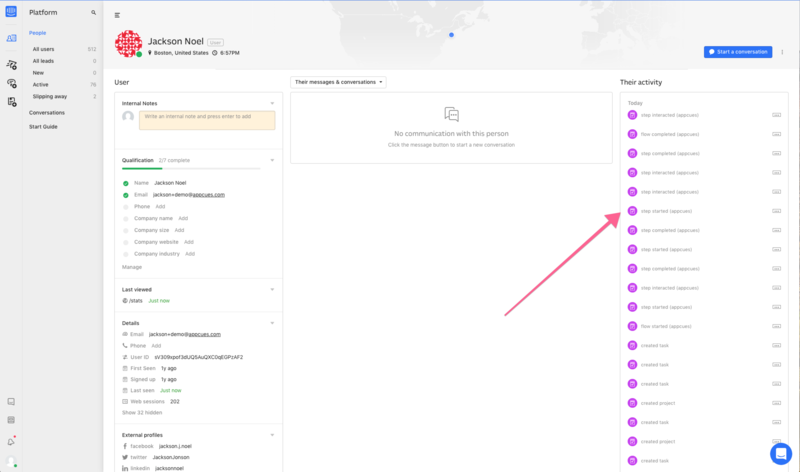 You can see how your Hubspot contacts interact with Appcues flows on an individual basis by viewing their contact page in HubSpot. If for example, you notice that prospects are viewing the same flows multiple times, you may want to reach out for personalized help or rethink how the information is presented in the flow. Integrating Treasure Data with Appcues allows you to see exactly what a user did in Appcues, combined with all your other touchpoints. If you use Segment throughout your platform, we highly recommend installing Appcues via your Segment integration. Installing through Segment will sync your Segment information (including user properties and events you collect from your own platform) to Appcues. Click here to learn how to install Appcues via Segment. After installing through Segment, you'll want to complete this integration for a two-way effect where Appcues sends data and events back into Segment. Segment is a powerful tool that collects your user data and pushes it into other specialized tools so your team and company can make the most of the information you all share. Integrating Appcues with Segment adds your Appcues data (which users have/haven't seen, completed, and interacted with your flows) into the mix. This integration can also send Appcues data into other tools you've integrated with, like Mixpanel, Heap, and Google Analytics. First install Appcues via Segment here. Clicking Install will redirect you to Segment where you can choose what data you would like to send into Appcues. This is the information you'll use to target flows to your users. To send Appcues data back to Segment, go to your Appcues Integrations page, hover over the Segment integration, and select Activate. To send Appcues data into other tools that (1) receive Appcues data and (2) that you use with Segment ( see a list here), enable these integrations directly in Segment. To disable your Segment integration, return to the account integrations page. Hover over the Segment integration and select Deactivate. Then in Segment, visit your Settings for Appcues and Delete this source. You can also remove the API keys. Appcues offers a handful of one-click integrations to your favorite services. Let's dig in to how to use Appcues' Google Tag Manager (GTM) integration. Note: This document covers how Appcues sends data to GTM via the dataLayer API. Use of this feature does not require that you install Appcues via GTM. We have separate instructions on how to install Appcues using Google Tag Manager. A Google Tag Manager account. You can activate this integration by going to the Appcues Integrations page and clicking "Activate" under Google Tag Manager. Appcues events will automatically be sent to Google Tag Manager when someone interacts with your Appcues flows. Google has a great example of how you could use this to trigger other tags, events and more within the Google Tag Manager interface. event — A description of the action taken by the user (e.g. "Flow Skipped (Appcues)"). See our list of analytics events for more information. appcues_event_id — A shortened, machine-friendly version of the event (e.g. "flow_skipped"). appcues_flow_id — The ID of the flow the user interacted with. appcues_flow_name — The name of the flow the user interacted with.